Norelco 9300 vs 9700: Which One Should You Buy? 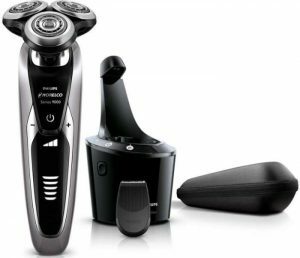 The Philips Norelco 9300 vs 9700 is the battle for the ultimate electric razor in Norelco’s high-end lineup. 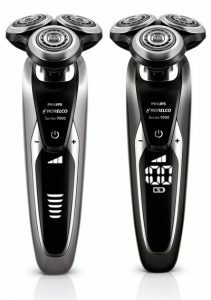 They incorporate the most advanced technologies that the company currently has to offer, resulting in what are arguably the best performing rotary shavers you can buy today. And that inevitably begs the question: should you choose the Norelco 9300 or the 9700? Philips Norelco has probably the most confusing naming scheme of all manufacturers; add the constant re-branding of older models, the release of new products, inconsistent model numbers (9800 is inferior to the 9700 for example) and you’ll have a hard time making a choice. In this Head to head edition we’ll take a close look at the differences between the Norelco 9300 and 9700 and find out which one represents a better option. 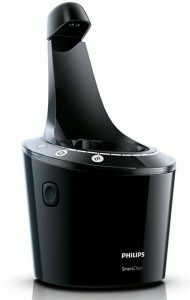 The 9300 and 9700 are part of the Series 9000, representing Philips Norelco’s line of high-end electric shavers. Both feature an advanced shaving head with excellent contour following capabilities, fantastic build quality and great wet/dry shaving performance. The 9300 and 9700 come with the SmartClean cleaning system which automatically cleans, dries, lubricates and charges the razor. Unlike the majority of shavers that feature an integrated pop-up trimmer, Norelco offers a click-on trimmer for the 9300 and 9700 that can be attached to the shaver, very handy for grooming and touch-ups. We’ll discuss all the important aspects regarding the 9300 and 9700 in greater detail below. Norelco 9300 vs 9700: what are the differences? Upon a brief inspection, the 9300 and 9700 appear to be very similar in many regards. They look almost the same and they use the same shaving heads (SH90). Both also feature three speed settings (Slow, Medium, Fast) that should better fit your skin and hair type. The first visual difference is the color surrounding the display on the front of the shavers. The plastic on the 9300 has a lighter shade of silver, while the 9700 uses a darker, gunmetal color. Norelco 9300 on the left vs 9700 on the right. The second difference between the actual shavers is how the remaining battery is displayed. The Norelco 9300 uses 5 bars, each representing 20% of the remaining charge, while the 9700 displays the exact percentage. Norelco 9300 (left) and 9700 (right) displays. The one used on the Norelco 9700 is probably better, being more precise, but it’s still a minor detail that shouldn’t be a decisive factor. The Norelco 9300 and 9700 come with automatic cleaning and charging stations called SmartClean. This system will clean, dry, lubricate and charge the razor. It uses detergent cartridges and works pretty much as advertised. The cost of ownership implied by the cleaning cartridges is quite reasonable when compared to Braun’s cartridges for example. Moreover, since Norelco’s cartridges don’t use alcohol, they will last longer (alcohol evaporates pretty fast). The stations use induction heat for drying the shavers after the cleaning cycle has completed. The main benefit of this implementation is a completely silent operation. The downside is that it takes a lot of time – around 4 hours – compared to a station that uses a fan. The SmartClean systems that come with the 9300 and 9700 are the same and use the same cartridges. The only difference is that the one included with the Norelco 9700 has an updated display, with a progress bar that spans across the top part of the shaving station and fills up as the cleaning process advances. The 9300 has a more basic display, with an indicator that only shows the operation currently taking place (like cleaning, drying etc.). The SmartClean station that comes with 9300 lacks the progress bar and only displays the current operation. If you don’t want the cleaning station, you can opt for the Norelco 9800 which is basically a 9700 without the cleaning station. But considering that it’s similar in price to the 9300 and identical in performance, I don’t think the 9800 is worth considering. 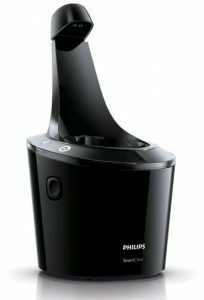 UPDATE: One of our readers signaled in the comments that as of 2016 all the 9000 Series shavers from Philips Norelco come with the same SmartClean station that doesn’t feature the progress bar anymore. This change can also be observed in the new product images and user manuals. By this point it should be pretty obvious that the Norelco 9700 is basically a 9300 fitted with fancier displays. However, the price difference between the two is pretty steep, the 9700 being significantly more expensive. The 9300 offers better value for money and it is identical in terms of shaving performance. And this is actually the only thing you should consider when trying to decide between the 9300 and 9700. 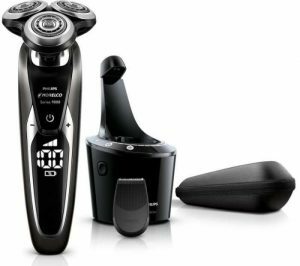 The 9300 offers an identical shaving performance, but it’s much more reasonably priced. The conclusion of this Norelco 9300 vs 9700 debate is actually a lot simpler than in the case of other shavers we’ve compared in the past. We can summarize it in the following statement: there isn’t a single compelling reason to justify the significant price difference between the Norelco 9300 and 9700. And that should make your decision pretty straight forward: the Philips Norelco 9300 is the better choice. Apart from a few minor and mostly visual differences, it is identical in terms of performance to the 9700 and, at least at the moment of writing, it costs a whole lot less. Unless you can find the Norelco 9700 at a similar price, the 9300 is the winner and the more sensible choice. Home » Articles & Guides » Head to head » Norelco 9300 vs 9700: Which One Should You Buy? You ar probably not correct on the difference between the 9300 and 970 cleaning system. I have a Philips 9711/31 for a couple of days and it also has the cleaning system without progress bar display. This particular version is also described in the manual. However, if I look in a 2014 manual of the Philips 9700, it also has the progress display bar. So it seems since somewhere 2016, for all 9000 types, the cleaning station progress bar version changed to a non-progress bar version. Thank you for the heads-up, I wasn’t aware of this change made to the 9700. I will update the post accordingly. Great reviews on this site. It appears as thought the price difference between the two on Amazon now is merely $30. So if the fancier display and gunmetal color scheme is something people really want, it’s a similar purchase now monetarily. thank you for your comment. That is correct, at this moment the price difference is not significant and either of the two represents a very good option. However, this price difference seems to fluctuate quite a bit and it’s always a good idea to do a bit of research before pulling the trigger. 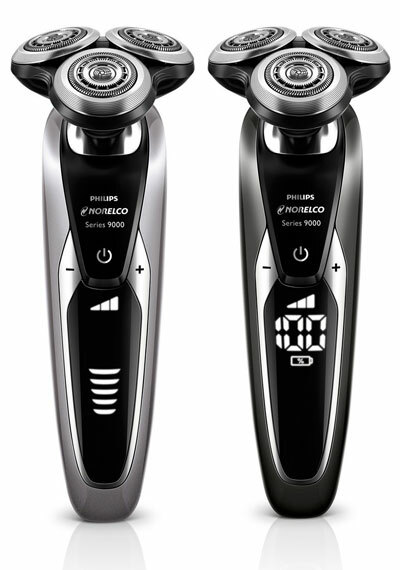 Norelco 9300 or 9700 are the same best rotary shavers for men. So for saving budget we can go to 9300. Sure if we want hight end tech, 9700 is a better opt. Can these cleaning stations be used with SW6700 or SW9700? As far as I know, only the SW9700 can be used with the compatible SmartClean stations (part no CP9060). Norelco told me that the battery last longer and charges faster in the 9700. Both need approximately one hour for a full charge. The battery on the 9700 should provide an extra 10 minutes worth of shaving time, but in reality they seem to be very similar in this regard. Is the 9300 good for shaving your head? I need a new electric shaver for my head. Yes, it should be very good at shaving your head as well. Does the charger for the cleaning station of the norelco 9300 included inside the box?or have to buy separately? Yes, the charger is included as well.